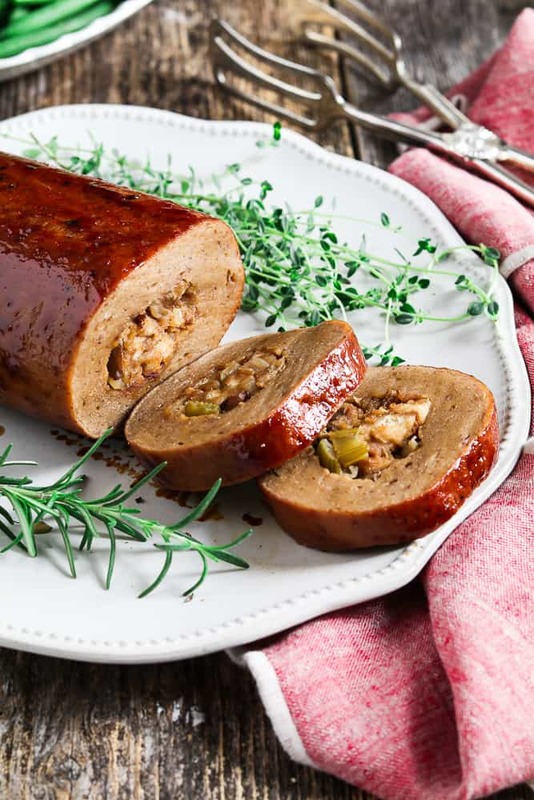 Make your festive dinner complete with this Vegan Holiday Roast. 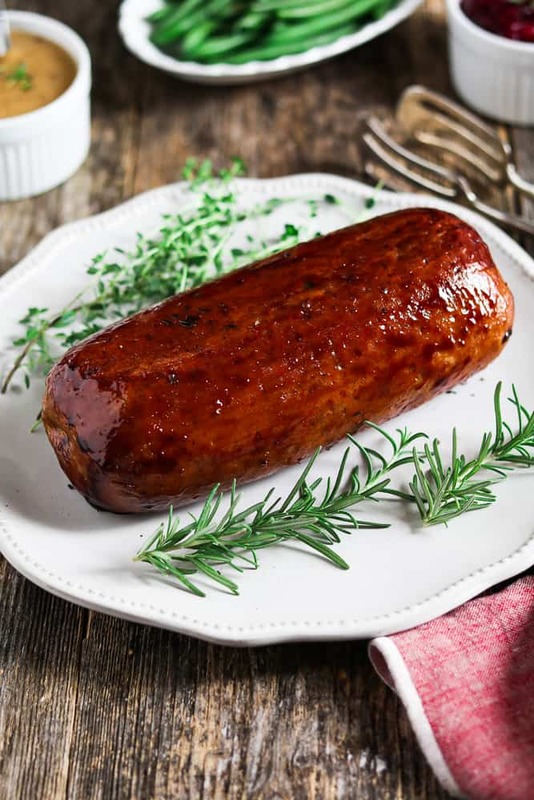 It’s filled with savory stuffing and finished with a mouth-watering glaze. Let the celebrations begin!! I’m SO ready for some spiked nog and a nice sit-down dinner with family and friends. I can’t wait! 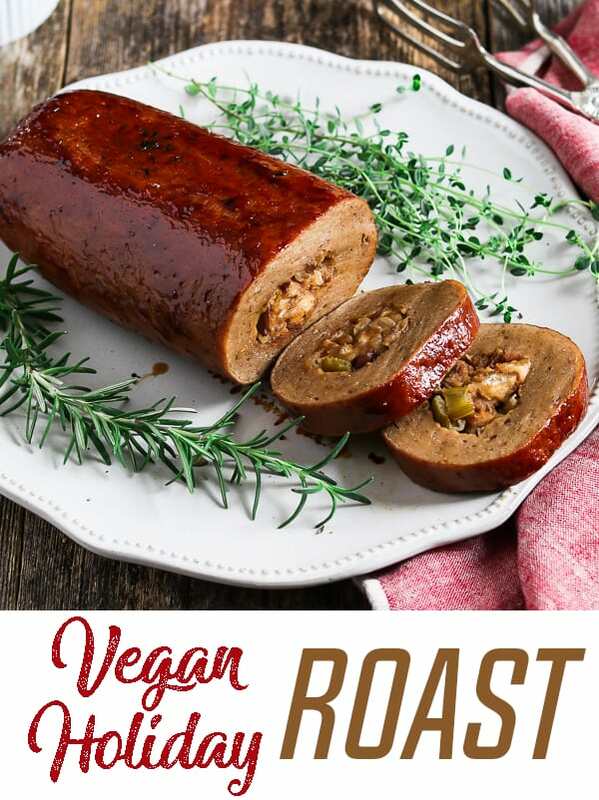 I usually make my Meatless Loaf or Vegan Mushroom Lasagna for the main entrée, but this year I want to change things up with this Vegan Holiday Roast. 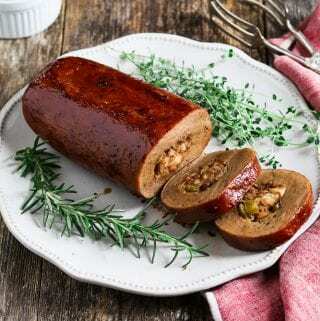 It’s a succulent (seitan-based) roast that’s stuffed with my Vegan Sourdough Bread Stuffing and topped with a subtly sweet glaze. It also makes a beautiful centerpiece that will impress your guests. In a blender or food processor, blend all of the ingredients together until smooth (except the vital wheat gluten) and add it to a large mixing bowl. Add the vital wheat gluten to the bowl and stir until a dough starts to form. 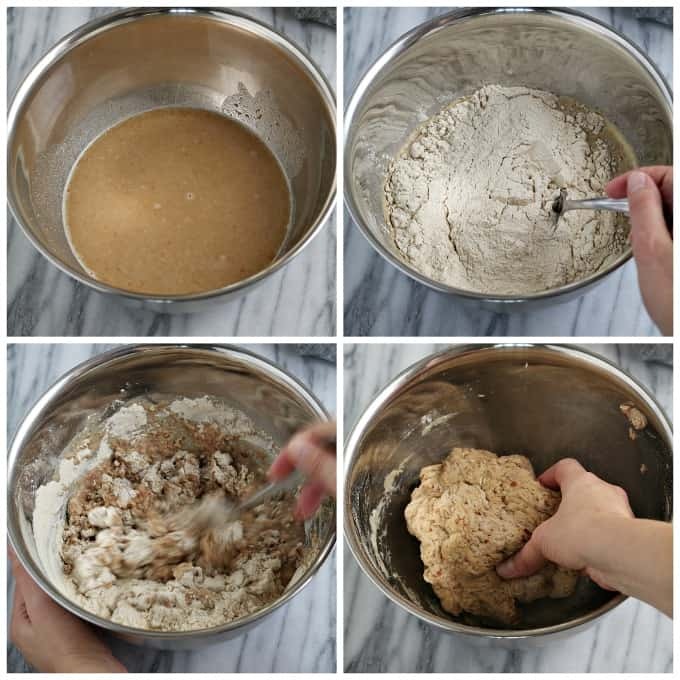 Using your hands, knead dough until fully combined. The dough will feel thick and somewhat elastic. Knead for a few minutes more on a smooth surface. Now start rolling it out with a rolling pin (approximately 10×7). Roll from the middle outwards and repeat on the other side. Roll both vertical and horizontal to stretch it out to the desired size. 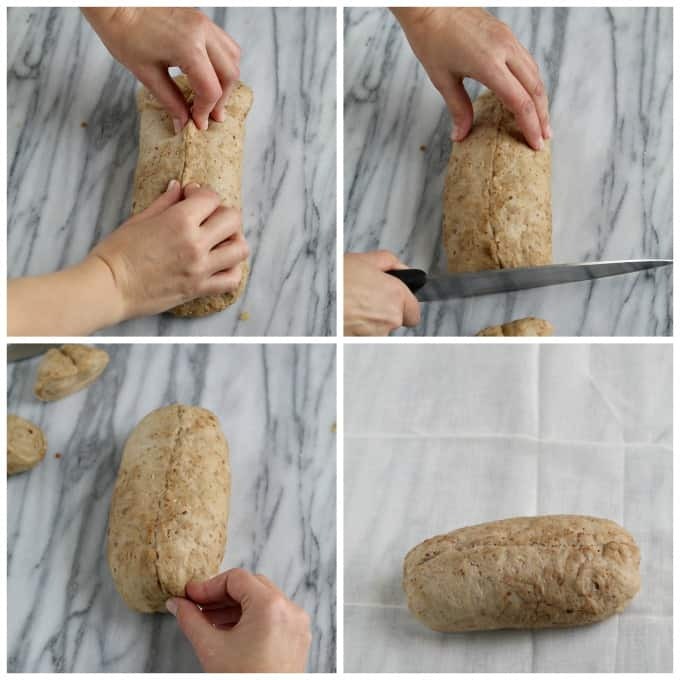 Using your hands, lightly pack the stuffing into a log shape and place in the middle of the dough. Bring both ends together over the stuffing and pinch closed. Continue to pinch the rest of the dough closed through the middle and ends. Pinch really well too avoid separation. If there is extra dough at the ends, just trim it and pinch closed again. You want the stuffing to reach the ends to avoid a gap inside the roast. Spread out cheesecloth and tightly wrap the roast with at least two layers. Twist the ends and tie with twine. Place the roast in the casserole dish and add about 1″ of broth on the bottom. Throw in some fresh herbs and bay leaves if preferred. Bake for 1 1/2 hours and rotate every 20 minutes for even cooking. Add a little more broth if it cooks off. Poke the roast to check to doneness – it should be firm. If it’s still soft, then cook it a little longer. When it’s fully cooked, remove from oven and unwrap the cheesecloth. Pour out the remaining vegetable broth. Place back in the baking dish and brush the tops and sides with the glaze. Bake until the glaze becomes tacky (about 5 minutes). Fip the roast and glaze top and sides again. Bake about 5 minutes more. Remove from oven and let the roast rest for 10 minutes before carefully cutting with a serrated knife. 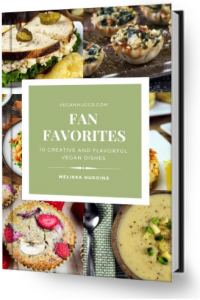 What should I serve with a Vegan Holiday Roast? Preheat your oven to 350 °F (177 °C). Place the portion you’ll be eating in a covered baking dish. It will get too dry if you leave it uncovered. You can top it with some gravy for extra moisture. Cook until heated throughout. 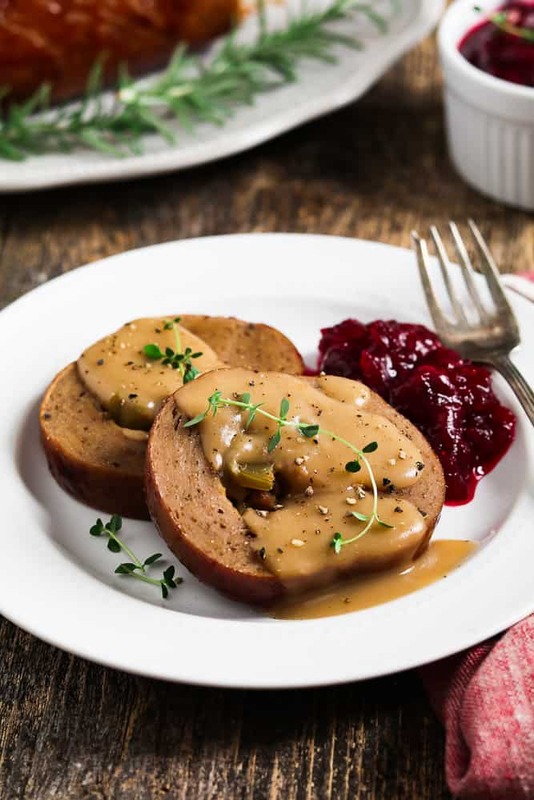 Make your festive dinner complete with this Vegan Holiday Roast. It's filled with savory stuffing and finished with a mouth-watering glaze. Preheat oven to 400 °F (200 °C). You'll need Cheesecloth and a 2-quart Baking Dish (Preferably one that is at least 2.5 " deep and no larger than 9X9) * Make sure you have the stuffing fully cooked before beginning and let it cool before stuffing the roast. Whisk the teriyaki and barbecue sauce together. Set aside. Add all of the roast ingredients *except the vital wheat gluten* to a blender or food processor. Blend until everything is broken down and smooth. Pour into a large mixing bowl. Add the vital wheat gluten to the wet mixture. Stir with a fork or spoon until a dough starts to form. Now, using your hands knead dough until fully combined (*the dough will be thick & elastic). Place dough on a smooth surface and knead for 1-2 minutes more. 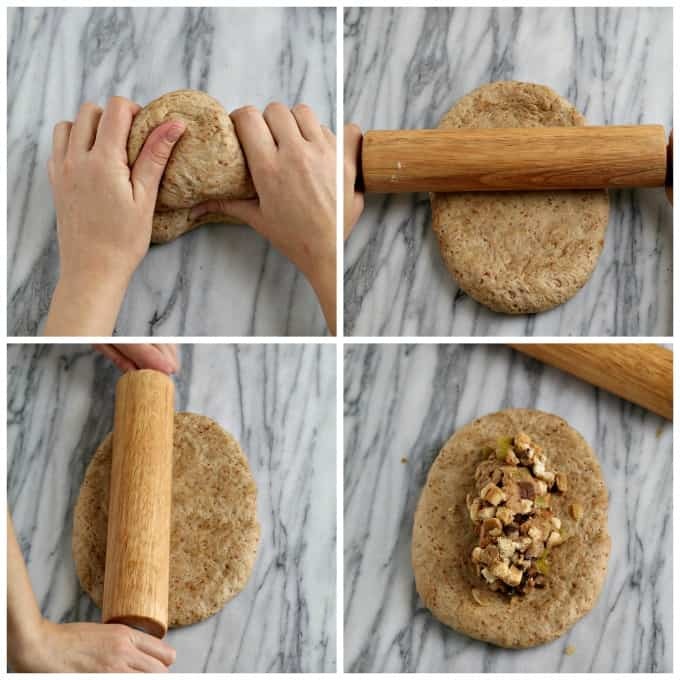 Roll it out with a rolling pin to approximately 10x7. Roll from the middle outwards then flip and repeat. Also, roll both vertical and horizontal until you've reached desired size/shape. 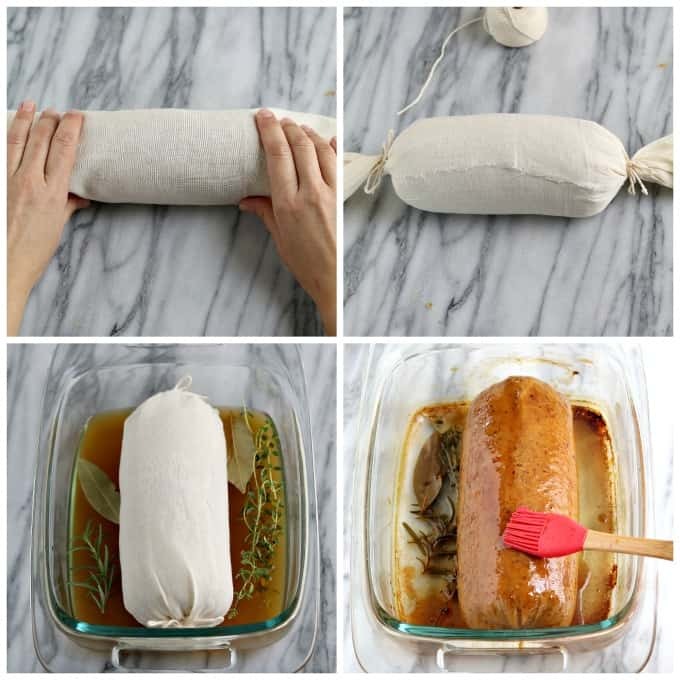 Lightly pack the stuffing into a log shape and place in the middle of the dough. Now, bring both ends of the dough together over the stuffing and pinch to close well. Continue to pinch the rest of the dough closed through the middle and ends. Pinch well too avoid separation. (*If you have excess dough at the ends, just trim it and pinch closed again. You want the stuffing to reach the ends to avoid a gap inside). Now tightly wrap the roast with at least two layers of cheesecloth (more if the fabric is thin). Twist the ends and tie tightly with twine. Trim off excess cloth. Poke the roast to check for doneness- it should be somewhat firm on the outside, but it will still be a little soft on the inside. You just don't want it to be so soft that it caves in when you poke it - then it will need to cook longer (the roast firms up more when it's baked unwrapped with glaze). When done, remove from oven and carefully unwrap the cheesecloth (*if it sticks to the roast, you can use a splash of vegetable broth to remove it). Pour out any remaining broth in the dish and discard. Place the roast back in the baking dish and liberally brush the tops and sides with the glaze. Bake for 5 minutes until the glaze becomes tacky (*watch carefully to prevent burning). Now flip the roast and glaze top and sides again. Bake for another 5 minutes. Remove from oven and let the roast sit for at least 10 minutes before cutting. If desired, serve the roast with Vegan Gravy, Sautéed Green Beans and Cranberry Sauce. Prep time doesn't include stuffing. I have a question. Is it possible to make the roast in a slow cooker? I’m making several dishes (also for the meatlovers in the family) and I might not have enough space in my kitchen. Do you think you can make this the day before and then reheat, or even freeze? Maybe this is a silly question, but do you use codes and completed stuffing in the middle or before you’ve baked the stuffing on its own? Make it a Vegan New Year! You’re most welcome!! Happy New Year! !